Call Gary Now 07760 710919 to discuss your requirements. 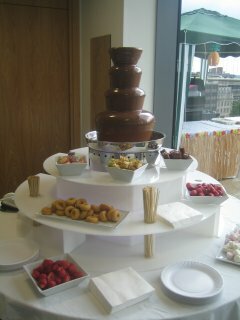 Our professional chocolate fountains Manchester area can cater for 20 upto 800 ,guests. 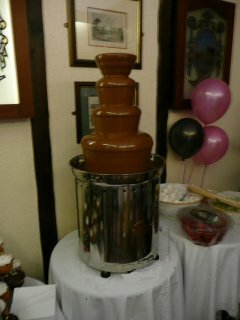 1 -Our impressive 1 meter 12cm tall chocolate fountain which is one of the largest available- CALL FOR PRICES. 3- 18 inch- hire small chocolate fountain suitable for smaller events and parties again with finest Belgian curvature chocolate. All our fountains are Pat tested in line with current regulations, we never re-use chocolate. Thankyou so much for the yummy chocolate fountain and dips at our daughters wedding last saturday, our guests loved it and everyone had a great time . Thanks again Gary the chocolate fountain was the highlight of the party ! The belgian chocolate tasted amazing, particularly with the strawberries and marshmallows, I will definitely use your services again. We know how important your event is to you and aim to give you excellent service at all times. Unfortunately we have recently had several phone calls distraught people who had been let down at the last minute by chocolate fountain hire companies, make sure you use a reputable company such as ourselves. What could make your event more special than a tall professional chocolate fountain running with delicious Belgian chocolate and a selection of dipping items of your choice. 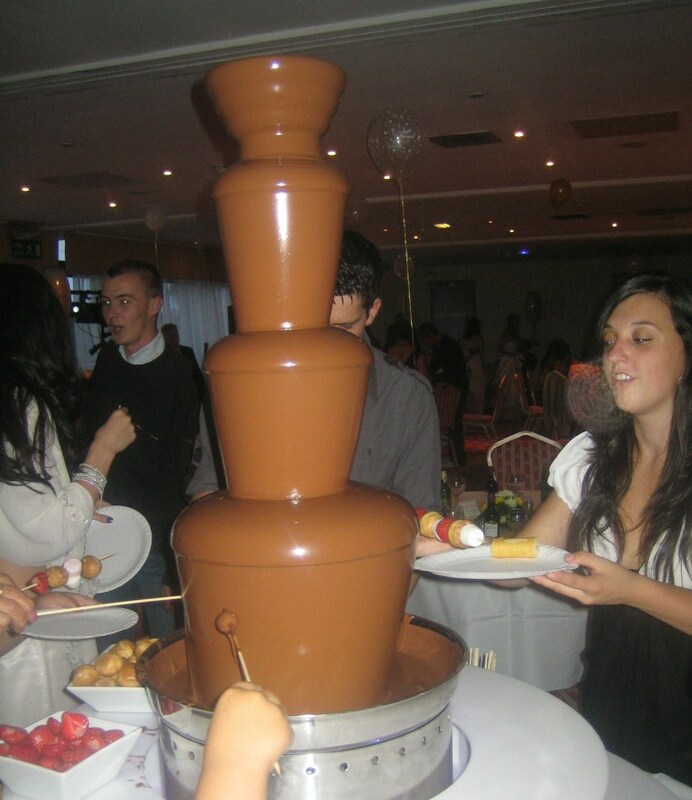 We cater for childrens chocolate fountain, chocolate fountain wedding, chocolate fountain engagement, chocolate fountain birthdays, anniversaries,chocolate fountain prom,chocolate fountain bar mitzvahs,chocolate fountain christening, chocolate fountain christmas parties etc We also cater Corporate chocolate fountain hire at corporate events. Not only an indulgent dessert a chocolate fountain fondue can be a great ice breaker particulartly at weddings and other events where guests may not know each other. 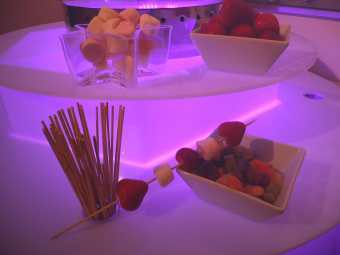 An interactive experience our chocolate fountains will make any event relaxed and enjoyable. 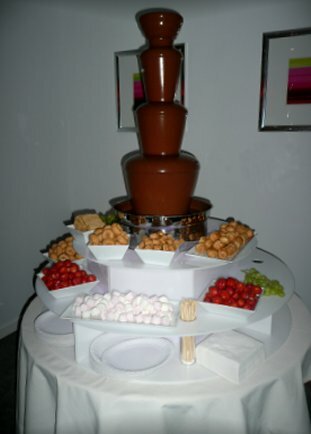 When you hire a chocolate fountain from us in Manchester and surrounds, your event will be talked about for months after. Our Illuminated base can be altered to match your colour theme or fade or flash . Sometimes the chocolate fondue fountain may be an enjoyable addition to the evening buffet, used for the wedding breakfast dessert or an alternative to the wedding cake. 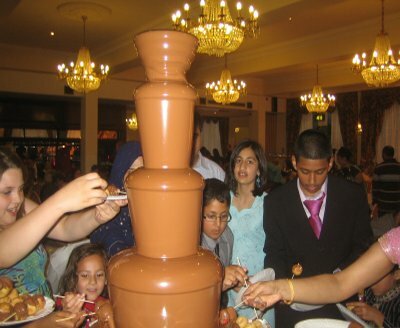 We have supplied chocolate fountains for Asian Weddings with hundreds of guests. 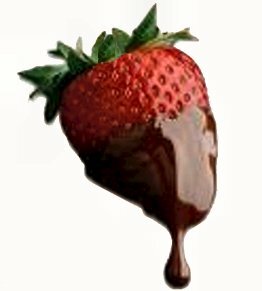 Either way the irresistable lure of smooth glistening chocolate cascading down a professional chocolate fountain will be irresistable to your guests. We only use the finest belgian curvature chocolate which tastes amazing and has a high proportion of cocoa butter that makes the chocolate flow smoothly. The chocolate is availiable in milk, dark, white or chocolate orange flavours. 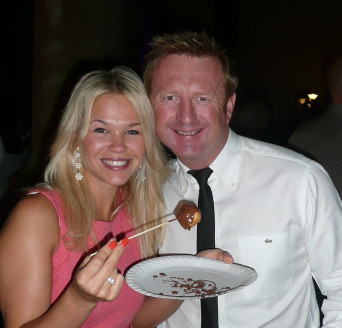 We have catered for local celebrity parties and corporate events manchester ! 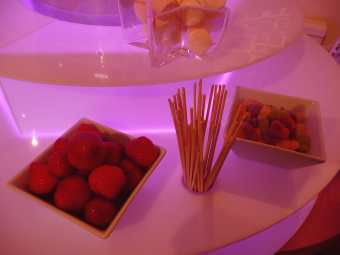 Our spectacular fountain packages can be tailored to your needs we include a selection of fresh fruit and sweets for dipping, our suggestions are strawberries (when in season), marshmallows, mini doughnuts, wafer twirls, turkish delight, marzipan etc.We provide skewers, paper plates and napkins. We can also offer Self service or Dry hire of the fountain, where we supply the chocolate and fountain, and you supply the dips and run the fountain. Our chocolate fountains are Pat Tested, and our smartly dressed staff are polite and friendly and trained in food hygiene.